Chief Master Sgt. Al Schneider, Eglin Air Force Base, Florida. "The most important quality in a leader is that of being acknowledged as such. All leaders whose fitness is questioned are clearly lacking in force. " CrossFit Level 1 Certificate Courses: CrossFit Reston, CrossFit TNT, CrossFit Southie, CrossFit Max Effort, CrossFit Charlotte, CrossFit St Paul, CrossFit Reebok Nuernberg, CrossFit NZ. CrossFit Kid's Course: CrossFit Atlanta. Chief Vassallo and Senior Chief Guza, Coast Guard Cutter Sherman. Canadian Forces Sergeant Prescott Shipway, 36, of Esterhazy, Saskatchewan, Canada, assigned to the 2nd Battalion, Princess Patricia's Canadian Light Infantry, based in Shilo, Manitoba, Canada, was killed on September 7, 2008 by a roadside bomb in Kandahar province, Afghanistan. Maintaining a stable core makes the handstand push-up more efficient. Tommy Hackenbruck, "Karen" portion of "The Girls" Event. "Errors of opinion may be tolerated where reason is left free to combat it." 2012 Reebok CrossFit Games Winners. Matt Ross (age 15): 115-145-165-200-205lbs. Do three Burpees after every five broad-jumps. If you've got a twenty pound vest or body armor, wear it. How can this athlete improve her bench pressing position? In what way can this position be improved? 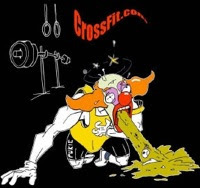 CrossFit Level 1 Certificate Courses: CrossFit Ethos, CrossFit X Factor, CrossFit Charlotte, CrossFit Roots, River North CrossFit, CrossFit Virtuosity, CrossFit Champions, CrossFit Centrum, Revolution X.